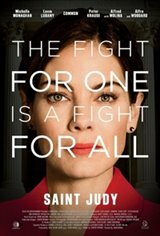 SAINT JUDY tells the inspirational true story of immigration attorney Judy Wood and her fight that changed American asylum law forever. In her first case, Judy represents a woman forced to flee her home country after being persecuted by the Taliban for opening a school for girls. While juggling her life as a single mother, Judy fights tenacious battles in and out of court, not only saving her client's life, but changing the Law of Asylum in the United States. This case has saved the lives of thousands of other persecuted women around the world.